Cumberland, BC resides quiet, quaint and nestled at the foothills of the Beaufort Range. The community’s expansive backyard rises and falls for hundreds of hectares up and down the sides of these mountains, through tumbling valleys, ravines, chutes, and spurs; old growth and second growth trees stand tall, rivers ebb and flow below the canopy. This landscape is home to some of the most iconic, pristine mountain biking terrain in the country. The labyrinthine trail network presents an inspiring and dramatic backdrop to a once thriving hub, which for a time lost favor, but is now resurging due in large part to the allure of the mountains. Consider this fact, though. The trails in Cumberland were not legally used by recreationalists up until very recently when, on January 31 of this year, a ‘monumental’ land use agreement was signed, for much of this land is privately owned by TimberWest Forest Corporation. TimberWest is Western Canada’s largest private timberland company, with 325,400 hectares on Vancouver Island. 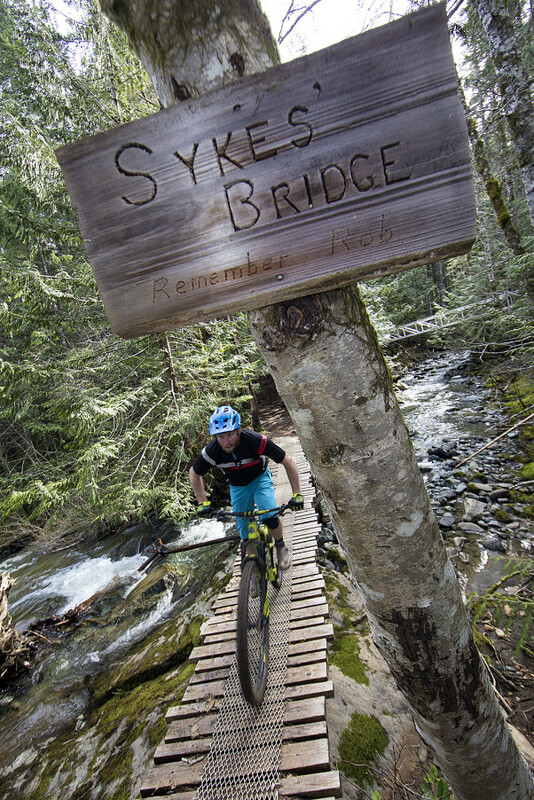 In fact, bikers, runners, and hikers were blatantly trespassing, sometimes carefree in their jaunts, sometimes clandestine in the building of bike and run friendly trails, and sometimes demonstrating a certain disregard toward existing land owners. Here’s the dichotomy. A fertile landscape representing the backbone of a small town, a driver of economic forces and stunning provider of recreational use for locals and those who come from afar; accessible and alluring, but essentially illegal. Recreationalists were, intentionally or otherwise, breaking the law by entering the area. Something needed to give. Small communities have a way of binding together for the common good and Cumberland is no exception. The Cumberland Community Forest Society (CCFS), a not-for-profit group whose mandate outlines a plan to purchase sections of land to ensure its safety and provide a legal playspace for the community, personifies this collaborative approach. They well knew the stakes were high and so they canvassed the local community and reached out to advocates, land users, and businesses for assistance in embracing their dream of legally accessing the surrounding countryside. Grasby, who owns Riding Fool Hostel in Cumberland, advocates for ready access to the expanse of trail network on his doorstep. “Over a decade ago, when the CCFS was purchasing its first parcel of land and developing language for the covenant that would guide future management of the land, the Cumberland Community Forest Society approached us and asked how they could provide for mountain biking on the soon to be acquired lands,” Grasby explains. Driven by a desire to advocate for the developing trail network surrounding Cumberland, a core group of riders, builders, race directors and business owners that shared a vision for mountain biking in Cumberland organized and became a registered non-profit society in February of 2008. And thus, the United Riders of Cumberland (UROC) was born. The figurative wheels were now rolling and about to gather momentum. Since that time, the CCFS and UROC have worked closely together. Their objectives align neatly—the CCFS aims to purchase and protect local land and UROC advocates for mountain biking and management of the trail network. On January 31 of this year, four signatories including the Village of Cumberland, UROC, TimberWest and Hancock Management, signed a multi-faceted agreement authorizing public recreation on private and public forest lands south of the Village, and giving private landowners the opportunity to better communicate and manage risks associated with people recreating on their land. Under the terms of the agreement, UROC will take on key trail management and maintenance responsibilities for the approximately 70-kilometre Cumberland trail network. They will also continue to work in partnership with local trail builders and other stakeholders and will work closely with the Village of Cumberland and private landowners on several trail infrastructure projects, including new trailhead information kiosks and the replacement of bridges over important stream crossings. 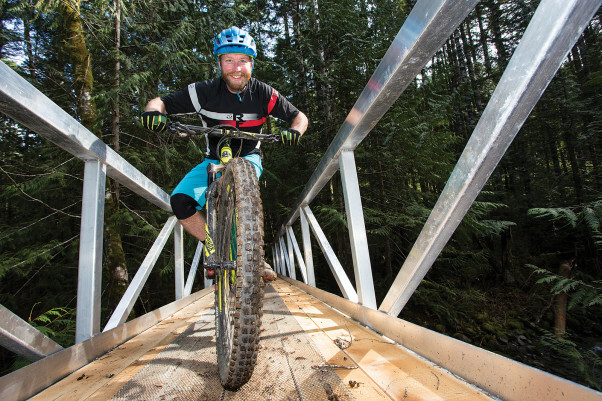 Grasby adds that the mountain bike community has developed a strong relationship with the property owners, and TimberWest has developed specific language in its logging plans to minimize impact to the trails where operationally possible. In some instances, boundaries have been relocated to preserve trails and in all cases TimberWest has committed to re-establishing the trail after harvesting is complete. “We have effectively developed a ‘no net trail loss’ philosophy with the landowners,” says Grasby, who was UROC’s first president and remains active on the board in the role of Secretary. According to a statement by UROC President Mike Manara, “This agreement represents the collective efforts of all parties involved and demonstrates what can be achieved through collaboration. I am proud of the UROC board for their dedication to this project and the commitment to making mountain biking a legitimate industry in our community. For their part, TimberWest claims to be a leader in sustainable forest management and is committed to Vancouver Island communities. Grasby recognizes that the new agreement will not change the core activities of TimberWest. “But this was not the objective,” he explains. Not all riders and recreational users of the area share Grasby’s enthusiasm. Some claim the damage has already been done, with many iconic trails already decimated and rebuilt, but not as they once were. In sections, vast amounts of trees have been felled and the lines and contours of the trails have been forever altered. There is a sense of irretrievable loss for many bikers. Meanwhile, pleased with the new agreement in place, The Cumberland Community Forest Society continues on with its push to purchase land so it safely resides in the hands of the people who choose to live there. It is evident that the only way to properly manage is to own, and for that the CCFS needs grants, donations, and financial assistance of any kind. Their mandate is indeed bold, but few if any question their standpoint that land ownership is of critical importance. The land use agreement between loggers and locals is unprecedented on Vancouver Island, according to Grasby. In fact, he says that numerous other clubs on the Island representing recreational land users have contacted UROC to better understand how to work alongside logging companies. It is an enviable position to be in, testament to the vision and ongoing efforts of both UROC and the CCFS. Enjoyed that mate. It’s these kinds of agreements that will keep our kind pedaling well into the future.